Diecast Articles, News and More. 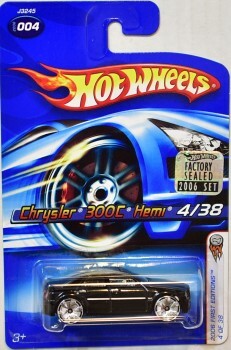 Part of my personal collection, this Hot Wheels Chrysler 300C is part of the Hot Wheels 2006 First Editions series. The Chrysler 300C was designed to be a modern interpretation of the Chrysler C-300, featuring a large grille, long hood and low roofline that was prominent on those vehicles. The styling retained many elements of the 1998 Chrysler Chronos concept car, such as chrome interior accents and tortoiseshell finishings on the steering wheel and shifter knob. Variations: YES – according to reference materials there are at least four variations of this series/model. Check out the books and guides we use as reference. FUN FACTS! – Mattel made a Blings version of the Chrysler 300C as part of the 2005 First Editions series with scaled-down 40-inch rims! This article uses material from the “Chrysler 300C Hemi” article on the Hot Wheels wiki at Fandom and is licensed under the Creative Commons Attribution-Share Alike License. 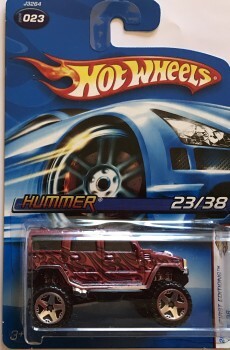 Part of my personal collection, this Hot Wheels Hummer H2 is part of the Hot Wheels 2006 First Editions series and is the first entry into Flashback Fridays. Flashback Fridays is where I intend to showcase one die-cast model that was issued a decade ago or earlier! Two color variants of this model came out in this series, one in metalflake dark red (pictured) and another in metalflake dark blue. Variations: YES – according to reference materials there are at least two color variations ‘metalflake dark red’ or ‘metalflake dark blue’ and five different variations in all of this series/model. Check out the books and guides we use as reference. This article uses material from the “Hummer H2 (2006)” article on the Hot Wheels wiki at Fandom and is licensed under the Creative Commons Attribution-Share Alike License. RE: Walmart - Free Hot Wheels Collector’s Edition 1987 Toyota Pickup via mail-order (purchase required). Mailed off everything for the Walmart promo today! Diecast Fanatics Facebook Group Debuts! Stanley on Free Hot Wheels Datsun Bluebird 510 from K-Mart via mail-order (purchase required).